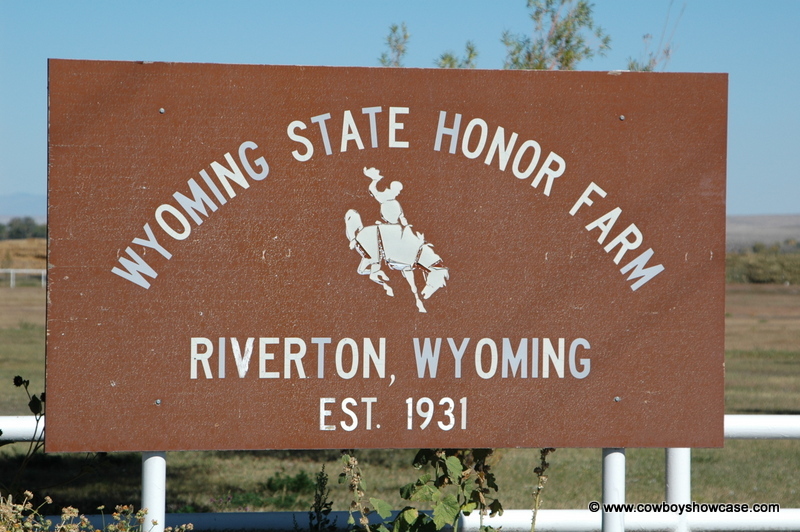 The Wyoming State Honor Farm established in 1931 and located at Riverton, Wyoming, uses wild horses for inmate rehabilitation. Its program, started in 1988, is the oldest horse program in the United States prison system. The Honor Farm is a 176-bed minimum-security prison for male felony offenders. The Wyoming Department of Corrections operates the facility. 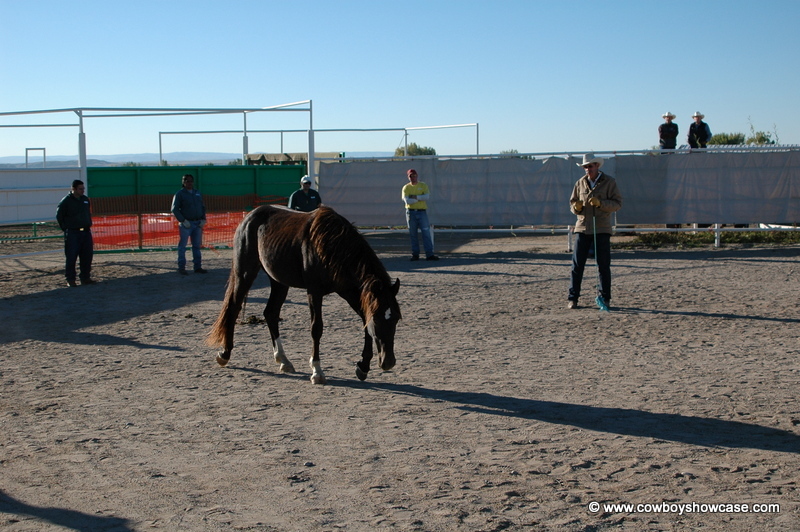 Work programs such as their Wild Horse Training Program assist in teaching inmates new job skills and improve their social and daily living habits. You may ask, “How can wild horses help these inmates become better citizens? When you place wild horses gathered off the open range with inmates who have no previous horse handling experience what happens?” The wild horse, with its large size and power, will not tolerate being mishandled and therefore demands respect. Horses cannot be conned. They only understand honesty. Wild horses off the open range have been free with no restrictions beyond those of survival. This is very similar to the inmates. They operated outside the law and beyond restrictions. Society wants these inmates to live within the law. The Honor Farm supervisors have found that the wild horse program plays a big part in inmate rehabilitation. Inmates working with wild horses learn that through honesty, respect, trust, patience, and teamwork, even an animal such as the wild horse will respond in a positive way. Inmates that are released after working in this program have a higher percentage of success in the outside world. 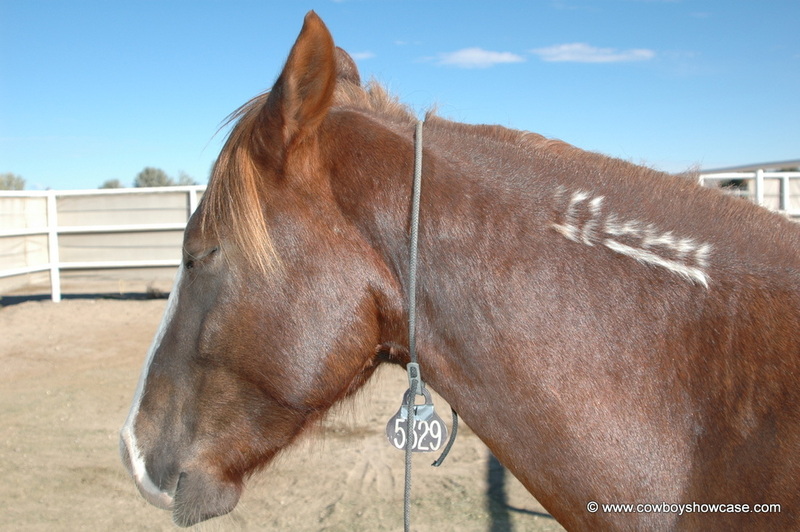 During September 2004, we traveled to Riverton, Wyoming to attend an inmate / wild horse training session, a wild horse horse-handling clinic by Wild Horse Supervisor Mike Buchanan and a BLM Wild Horse Adoption Sale. We observed first hand a training program developed at the Honor Farm that is unique in the horse world. The Federal Wild Free-Roaming Horse and Burro Act of 1971 gave the Department of the Interior, Bureau of Land Management and Department of Agriculture U. S. Forest Service a mandate and the authority to manage, protect, and control wild horses and burros on the nation’s public lands in order to insure healthy herds and healthy rangelands. The agency gathers excess horses from areas where the numbers of wild horses exceed the optimum number that the land, feed, and water can maintain. 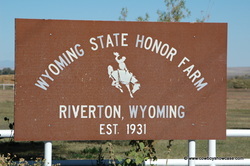 The Wyoming Honor Farm receives a portion of these. The BLM and the Department of Corrections have a working agreement concerning these horses. The BLM brings the wild horses to the honor farm. The horses, mostly geldings and mostly 2-3 years old, come from a number of western states including Wyoming and Nevada. The inmates work with the horses to gentle them for sale and adoptions. This is a “win-win” situation for both parties. The inmates working in the Wild Horse Program have voluntarily agreed and chosen to work there. Being assigned to the Honor Farm is a prison privilege. Inmates have dropped enough points for good behavior at other state prisons that they are transferred to the Honor Farm for the remainder of their sentences. Mike Buchanan, Wild Horse Supervisor at the time, [from 1995 to 2008], manages around 25 inmates and up to 200 wild horses in his current program. When Mike assigns an inmate to a job on Horse Hill in the wild horse program, the inmate begins by working on the horse feeding crew. This gives the inmate a chance to observe other inmates working with horses, the training techniques used, and become familiar with horses. This also gives Mike a chance to observe this new inmate and evaluate his performance. Many of these men have never been around horses before. This is not all bad since these men have no preconceived notions about how horses should be handled. They can be taught the correct way. The pay for an inmate in the horse program starts at $35 a month, which in turn helps pay for his restitution, child support, etc. and purchase his personal items. Most inmates that work with the horse program are there for 11 months to 2 years before they are released from the Honor Farm. We met Mike and his wife for supper our first night in Riverton. Mike looks like a true Wyoming cowboy- tall, slender, quiet, and soft-spoken. He also appeared to be a man who was in control of his surroundings. He would have to be in control to handle hard men and hard horses. We found out in visiting with Mike that he had grown up in the Steamboat, CO. area, worked on ranches, guided hunters, and wrangled dudes. He drifted northwest to the Baggs, Wyoming country, met his wife Karen, and married her in 1969. He worked on a large cattle ranch punching cows and starting colts. He worked in the oil well industry for a time. Then in the 1980’s he went to work for the State Prison System in Rawlins, Wyoming as a correction officer. While Mike was inside the walls at the Rawlins State Prison, he began to study inmates and the body language they use in their interactions with other offenders. He began to see there was a social structure with a pecking order among inmates that was similar to wild horse herds that ran free in the Wyoming Red Desert Country. 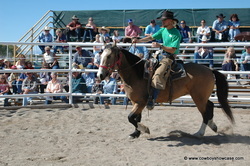 Mike transferred to the Riverton Honor Farm in 1994 and was offered the Wild Horse Supervisor job in 1995. He brought to this job 7 years of observing inmates inside the wall at Rawlins and a cowboy way of life working with horses and cattle. He also had the ability to “read” people and horses. Mike had found his calling and took to the inmate/wild horse program. Mike began to put some new ideas together. First, he found that the criminal mind had to change and working with wild horses could help do this. This is the beginning stage of horse training for both the new wild horse and the new inmate. The Wild Horse Supervisor teaches the inmate how to be safe around horses and the horse begins to learn that humans are not a danger to them. Trust is beginning to build for both inmate and horse. When the horse has completed the circle, it will go back to the person that is the least aggressive, and lower its head to the ground. Then the horse will go around the pen and stop in front of the inmate that is the most aggressive. Stops, ears will go up, and the horse will snort at this inmate. This snorting means that the horse senses danger. The horse will then be released back into the wild horse pens. While all this is going on, Mike is reading the horse and the inmates. A second wild horse is placed in the chute and is approached by each Level 1 inmate. They begin to place a hand on this horse through the chute gate. This is the first experience that the horse has to feel the human touch. It also is the first time many of the inmates have ever felt a horse. Again, we are building trust between the horse and the inmate. The horse is then released back into the wild horse pens. This level may be repeated several times until the horse becomes less resistant to the human touch. After the horse becomes less resistant to the human touch, a halter is placed on the horse while in the chute. A bungee cord is attached to the halter and tied to the side of the chute. This introduces the horse to pressure and release. The inmate learns to give back rather than take. 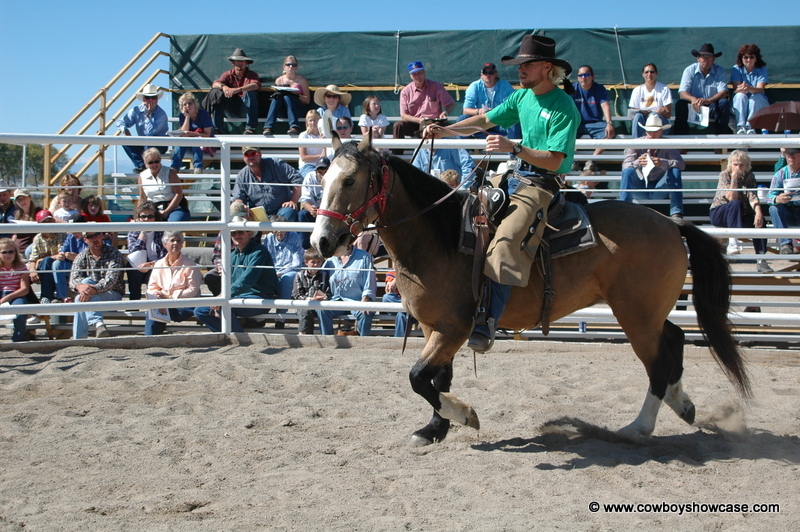 After the horse begins to accept the halter and bungee cord, they take off the bungee cord and a 30-foot soft cotton rope is attached to the halter on the horse while it is standing in the chute. With 3 or 4 men holding on to the rope the horse is released out of the chute. This is the first introduction to the horse learning to lead. The inmate learns to give back in order to establish harmony. After the horse is beginning to learn to lead, the horse is tied to an inner tube that is attached to the fence. This keeps the horse from injuring its neck if it falls back on the lead rope. Tying up the horse teaches it patience and respect. 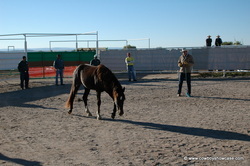 This exercise is also designed to encourage the inmates’ patience and respect for the horse. This is a more advanced, hands-on training program where the horse learns to be handled in the open without a chute. The horse at this level learns to let the inmate wash it, brush it, and pick up its feet. As the inmates progress with their horse handling skills, they are moved up in the level system just like the horses. At Level III, inmates begin to get the horse used to the saddle blanket and saddle on its back. A snaffle bit is placed in the horse’s mouth for the first time. The horse is asked to flex its body left and right. 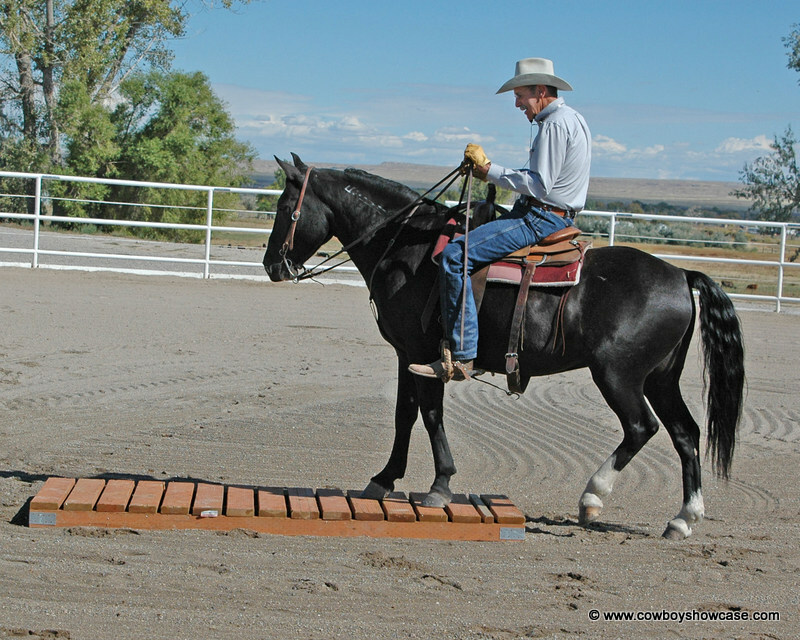 This teaches the horse to move in the direction you ask when you are on its back. The inmate is learning to “ask” the horse and not “demand” from the horse. This is the last step in the level system for both the horse and inmate. The horse is taught to accept a man on its back for the first time. The horse is taught to walk, trot and lope. To be successful, the inmate must make a commitment to stay in control of himself and still maintain control of the horse without aggression. Mike says in summary of the Level System, “We are not very good at taking a horse on from Level IV. Our main goal is to get the horse quiet and gentle, accept the saddle, so you can step on and ride off. When we go beyond this point the inmates do not have the horse handling skills to teach the horse the finer points such as side passing, changing leads, turnarounds, etc. However, I believe that one more level of horsemanship might be forthcoming in the future. Presently, when someone adopts these horses they can go on to the next level, if they so desire.” Most of the horses that offered for adoption and sale have around 90 days of training by the inmates. Training Clinic:On the day before the BLM Horse Adoption and Sale Mike Buchanan conducted a wild horse horse-training clinic for prospective horse buyers and other interested individuals. Mike discussed the Level System that is used at the Honor Farm and demonstrated horses on Levels 2, 3, and 4. Questions and answers followed each level. A BLM representative was also there to answer questions from the public. 56 horses were offered for adoption and sale. A catalog was made available which told about each horse in the sale. We arrived at Horse Hill before daylight to observe inmates catching and haltering wild horses in the dark. The horses were caught and haltered, then led out to a pen where they were brushed and groomed. I have caught a lot of horses in the dark but never 56 wild horses. The inmates had a system worked out. Some were catching, some haltering, and some leading the horses out. One inmate kept track of where each numbered horse should go. This system worked like clockwork with no running or chasing the horses around. You could see the trust the horses had in the inmates. You could also see the pride in the inmates for what they were able to do. The horses were tied side by side in a round pen after being groomed. Each horse was assigned a lot number that corresponded to the number of the horse in the adoption catalog. Prospective buyers began to drift in. They walked around the outside of the round pen where the horses were tied looking at their catalogs and the horses. The sale began with an auctioneer and a ring man taking the bids. Mike gave a short description of each horse that was up for bid. Some inmates rode level 4 horses into the ring. Other inmates led lower level horses that were not ridden into the ring. All but three of the 56 horses put up for sale were geldings. When the sale was over, most of the horses had sold. 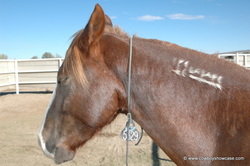 Those that did not sell were put back into training or were offered for sale by the BLM on the Internet. After the sale was over, everyone relaxed and we visited with Robert Lambert, Director of Department of Corrections who had driven to the sale from his office in Cheyenne as well as Honor Farm Warden Dawn Sides and Farm Manager, Joe Crofts, who also attended this sale. There were several representatives from the Bureau of Land Management. We thanked everyone for their hospitality and commented on their very professional wild horse/inmate program.